“Kaunas pantomime theatre was establishment in 1968 of theatre founder and leader, artistic director Kestutis ADOMAITIS. This year the theatre has started its 40th season. Kaunas Pantomime Theatre is the only Lithuanian professional ensemble theatre with a repertoire of this genre only. In its repertoire the theatre has as many as 35 plays of different styles. It is enough to have a look at the repertoire to see the range of creative work: S.Beckett, F.Kafka, R.Bach, W.Faulkner, A. de Saint-Exupery, E.Ionesco, V.Hugo, G.Boccaccio and many other most famous playwrights. The specific character of pantomime as a genre that creates no language barrier makes it possible to show the performances to audiences of all countries. The theatre performed in many foreign countries where had multifold tour, such as Germany, Russia, Romania, Latvia, Syria, Jordan, China, Moldova, Ukraine, Belarus, Poland, Denmark etc. The Ministry of Culture of Lithuania granted a special status of professional theatre, and the troupe of the Pantomime Theatre was appointed to act at Kaunas State Drama Theatre. The work at this theatre was started from 1982. Several premiers were presented as a result ? the performance ?Zoology of Invertebrate?, ?Jonathan Livingstone the Seagull? according to the allegorical tale of R.Bach and others. The theatre stages the performance of absurd ?Happy Days? on the basis of short stories of S. Beckett ?Happy Days?, ?Waiting for Godo? and others. In 1984 the theatre participates in the international festival of S. Becket?s plays in Moscow with this performance. In 1985 theatre to rise laureate of XII International Junior festival in Moscow. 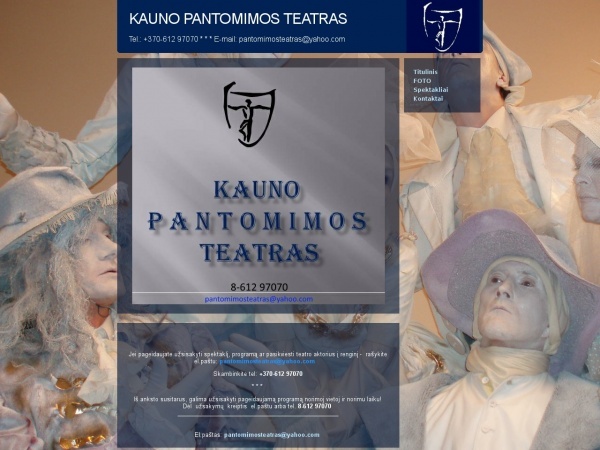 Kaunas Pantomime theatre tours places: Hamburg, Hanover, Braunsweig, Warszawa, St.Petersburg, Moscow, Riga, Kiev, Praha, Lanzhou, Kishinev, Minsk, Sibiu, Lvov, Konigsberg, Aalborg and ect. In 1987 the Pantomime Theatre is moved to the State Philharmonic in Kaunas. A number of premiere performances are presented to the audience in the new premises. In 1988 the theatre is reorganised and becomes the creative-structural division of the Lithuanian Theatre Union with a status of an independent body. In 1992 the theatre moves to the own stationary premises at E.Ozeskienss str.12. A number of trips are organised with performances, the theatre participates in international theatre festivals. In 1996 the activity of the theatre and its actors is presented in the illustrated art album “””Kaunas Artists”””. Meanwhile, the founder of the theatre and artistic director Kestutis Adomaitis experiences a tragic event and dies on December 22 of the same year. In 1998 a premiere of the plastic drama ?Salvador Dali. Burning Giraffe? is presented in Kaunas. A joint creative project ?Imaginations? is organised with Braunsweig pantomime and dance troupe in Germany. In 2003 Kaunas Municipality becomes the founder of Kaunas Pantomime Theatre. >From 2008 Kaunas Pantomime Theatre turn the budgetary theatre of Kaunas Municipality.